My time spent at the Final Fantasy XIV tour didn’t just include a preview of the areas to be found in the upcoming beta. No, we proud and few got the chance to also explore some of the game’s other iconic areas, areas closed off at the start of the beta but slated for opening later on in the testing process. 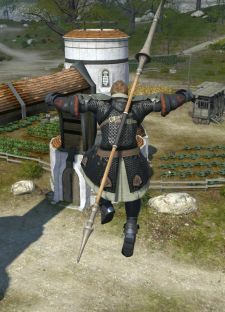 I poked around both of these regions, touring both the streets of Ul’dah in Thanalan and the cliffs and plains of La Noscea. These areas were admittedly still a work in progress. While the maps were mostly finished, the enemies in many of the regions were placeholders, and it was clear that the client we were using had a version with these regions in a state that’s not ready for prime time. Still, it was interesting to look at both and see things that had been changed, updated, and in a few cases removed altogether. Before I proceed, a note: All of the areas under discussion are still being optimized and improved, so some elements such as lighting and geometry may change by the time you get to play with them. It’s impossible to play Final Fantasy XIV’s launch version without being intimately familiar with Ul’dah. The city wound up serving as the de facto player hub, especially since it also had the most logical layout of the three capitals and was the most centrally located. I knew that the main cities hadn’t been changed extensively, but even minor changes would stand out like a sore thumb in the city. 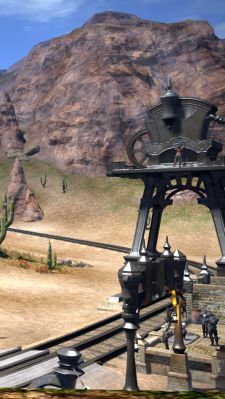 The first thing that struck me was the result of removing the market wards: The Flames’ new headquarters are located in an alcove adjacent to the Aetheryte plaza, similar to the alcove that serves as the front of the Platinum Mirage. Most of the guild houses have remained largely unchanged, but a few of the passages within the city have been altered slightly, just enough so that old players will stumble over differences. On the upper level of the city, the cold stone has been replaced with opulent red carpeting, with many parts of the city benefiting from added details and decoration. While the Wellhead Left was non-functional, a prominent sign indicating the airship landing has been added to both the upper and lower floor, while the avenue between the Gold Court and the Quicksand has been widened slightly and given an impromptu stage in the center. More than anything, the revamp is made plain by extra NPCs on the streets, notices on storefronts, and bits of interest all over the place. The city is mostly intact but feels quite different from its original incarnation. Here is where the major deviations begin. It’s easy to see points of similarity between the old Thanalan and the new one, but the two regions are immensely different, starting with climate. Where Thanalan was previously nothing but badlands and desert with a handful of oases scattered about, the central area now more closely resembles the Serengeti. Thin grass grows in various places, trees stretch above the landscape with thick trunks and broad boughs, and moles still dart about as they always have. Black Brush has gone from being a small camp to being full-featured, with reasonable buildings and plenty of bustling activity. Not too far from the camp, players can find several ruined buildings, ones that appear to be the subject of a new excavation. The mining caves have been refurbished as well; rather than simply having some scaffolding at the gate, the caves now have tracked bridges in place as well as mining carts and a handful of support buildings. It’s easy to see the source of this new lushness, as water now flows freely though the region, which includes a small waterfall. Certainly Thanalan retains much of its dry and dusty character, but this portion of the area is far more lush and green than before, which brings to mind a region in a state of an unexpected shift. Also worth noting that new monsters were roaming in the area, although those may simply be placeholders for the moment. I was informed before the tour of La Noscea that while Limsa is mostly working, the city was not entirely safe to traverse in terms of server stability. 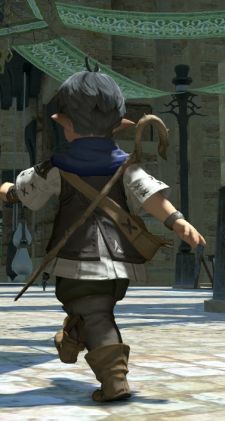 Instead, I stayed outside of Limsa, and that was more than journey enough. Unlike Thanalan, this region has undergone no major climate changes; it’s still white cliffs, thick grass, and cobbled stone. The difference is one of scope. Before, the island was devoid of any human habitation beyond a handful of Aetheryte camps, but now it’s covered in houses, farms, piers, and all manner of fascinating details. Perhaps most interesting to me was something sitting off the southern coast. At a distance, I could see a crystalline formation there, but as I drew closer, it became clear that it was one of the meteors summoned by Bahamut during the Calamity. The sea itself has reacted in agony, a sign that the king of dragons yet casts a long shadow on Eorzea. It wasn’t far from several docks, ones that I managed to break by jumping over a gate and falling through the sea. This would be a good time to point out that you still cannot go swimming. After a bit of laughter, I went back to wandering the region, which is an almost incalculable departure. 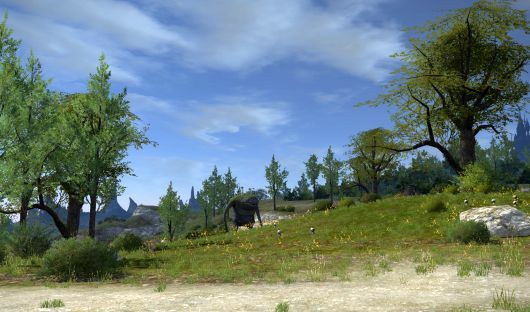 The fact that buildings dot the landscape help make the area feel more alive, and they also contribute to the sense of difference between the game’s various regions. Here, as you’d expect from Limsan society, settlements are placed wherever they fit and serve a function. Even in the places where the fundamental map elements haven’t changed much, the actual character of the maps is worlds different. Far from being the massive expanses of similar ground in the launch game, each region has a distinct character and is overflowing with little touches of detail. Red Rooster Stead goes from being a farm in name only to a neatly cultivated patch of land with obvious function and the form to back it up. Public notices are posted outside of shops in Ul’dah. Flowers bloom in patches around the water in Thanalan. The region around Gridania makes the overall zone changes a little more obvious, but from what we’ve seen of these regions, the new Eorzea will be a gorgeous place indeed.